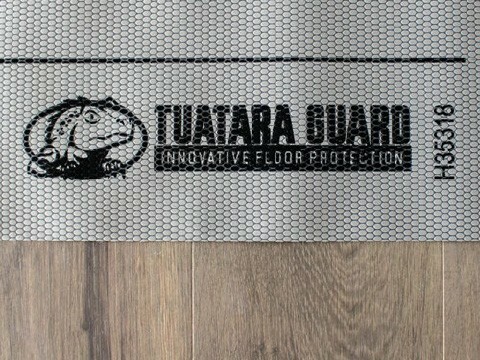 Tuatara Guard is an innovative floor protection product. Recyclable & reusable. The 5 layered toughened surface offers spill absorption with built in cushion technology. The surface also offers a patented slip resistant GripSpot Technology walking surface. Industry leading tear and tensile strength to withstand high traffic demands. Specifically designed to protect your floor within commercial, industrial or residential use. Protects your floor from construction damage caused by tools, machinery, foot traffic and blunt impact. Tuatara Guard features a patented slip resistant GripSpot walking surface.